Sacramento State is the first campus in the California State University (CSU) system to offer Peace Corps Prep, a certificate program for undergraduates. It launches in Fall 2018. “One of the Peace Corps goals in developing this program is to ensure that all volunteers reflect the diversity of U.S. society, which is why they were very interested in a partnership with Sacramento State,” says Julian Heather, professor of English and the Peace Corps Prep program advisor. Sac State is home to one of the nation’s most diverse student populations, coming in at No. 4 in U.S. News & World Report’s 2018 rankings of the top “Campus Ethnic Diversity Regional Universities” in the West. Only three other CSU campuses made the list. The University's selection to institute the program underscores its reputation and record. “Sac State is a globally minded campus, with an inclusive and considerate culture," said Lorry Marvin, regional recruitment supervisor for the Peace Corps West Region. The program is open to all undergraduates, regardless of their major. They receive specialized training that prepares them for international service, as well as instruction in a foreign language, intercultural competence and professional leadership. Agriculture – They work with small-scale farmers and families to increase food security and production, helping them adapt to climate change and promote environmental conservation. Community Economic Development – Volunteers often teach in classrooms, and they help entrepreneurs and business owners develop and market their products. Environment – Volunteers teach environmental awareness to schoolchildren and community members, empowering them to make decisions about how to protect and conserve the local environment. Health – Health volunteers promote nutrition, maternal and child health, basic hygiene, and water sanitation. They also provide HIV/AIDS education and prevention programs. Youth in Development – This sector allows volunteers to promote engagement and active citizenship, including gender awareness, employability, health and HIV/AIDS education, environmental awareness, sports and fitness programs, and information technology. 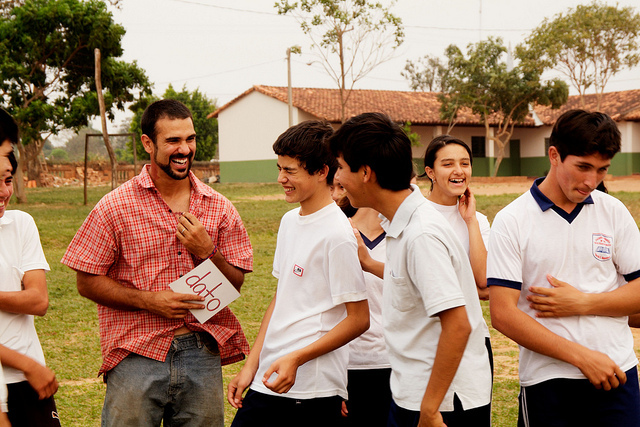 Education – This is Peace Corps’ largest program area. Volunteers work in elementary, secondary, and postsecondary schools as math, science, conversational English, or source teachers. Some also develop libraries and technology resource centers. No two Peace Corps volunteer experiences are exactly the same. Take Sac State graduate student Bob Nguyen, for instance. His counterparts in Ethiopia lived in rural villages, helping the impoverished residents. Meanwhile, Nguyen lived in a modern city apartment and taught English as a second language to gifted 15- and 16-year-olds at a suburban boarding school. It was a special request from the school to the Peace Corps. The idea for the Peace Corps dates to October 1960, when President John F. Kennedy, in a speech at the Cow Palace in San Francisco, proposed “a peace corps of talented men and women” who dedicate themselves to “the progress and peace of developing countries.” Congress approved the Peace Corps as a permanent federal agency in September 1961. Twenty years later, it became an independent agency. Since 1961, more than 230,000 Americans have served in 141 countries. The Peace Corps Prep program, established in 2007, has partnerships with 75 academic institutions throughout the country – now including Sacramento State.